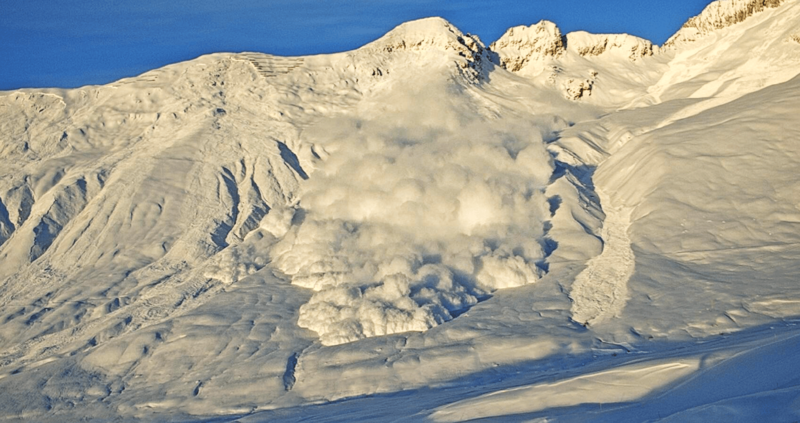 The avalanche radar is an effective technology for reliable automatic avalanche detection. It offers crucial advantages over conventional, local sensor that are installed in a known flow path. 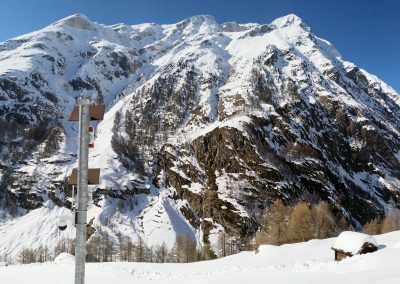 Radar works in any weather and at any time of day, has a range of up to 5 km and covers large avalanche slopes with a single device. 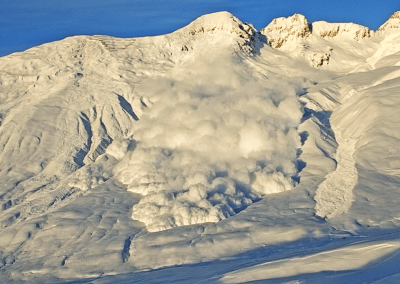 The avalanche radar is designed to provide an early warning of avalanches and to trigger an alarm. In the event of an avalanche, roads and railway lines are automatically closed within seconds and people in the danger area are reliably alerted. 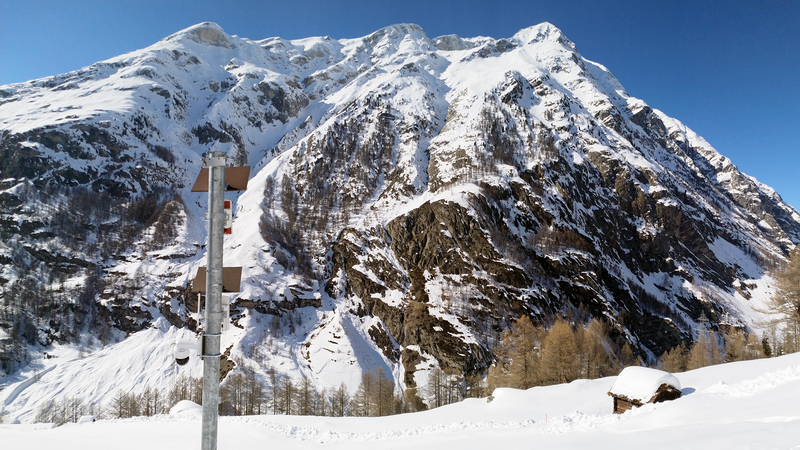 The avalanche radar is also applied for avalanche control works to verify the success of an artificially triggered avalanche. Without radar, this is particularly challenging in darkness or bad weather conditions (fog, snow, rain). 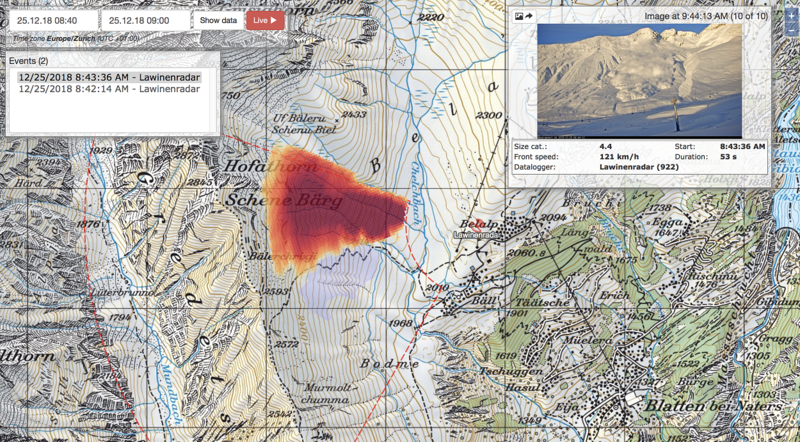 The radar locates the avalanche and tracks it as long as it is within the field of view. At the same time, the radar triggers a system-integrated camera that automatically records images or a video of the event. The station transmits all avalanche data to the online data portal, where the avalanche is displayed on an area map including avalanche characteristics (time, duration, speed, size, etc.) and photos. A statistical evaluation of the avalanche detections in winter 2017/18 by the avalanche radar in Zermatt showed that more than 80% of the avalanches occurred in poor or no visibility. 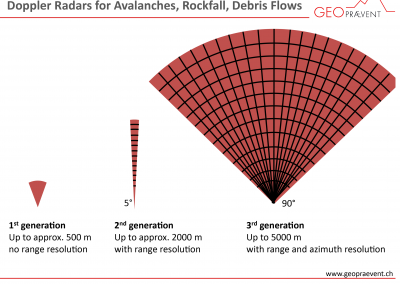 Click here for the avalanche radar infographics! 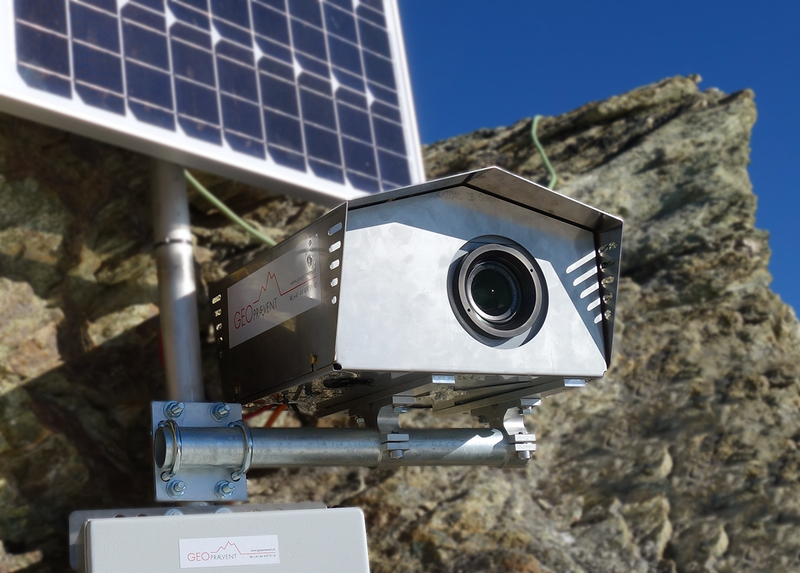 A similar radar system can also be used for the detection of rockfall or debris flows and for the detection of people in areas at risk, e.g. associated with artificial avalanche triggering. The avalanche radar reliably detects avalanches in any weather and at any time of day. 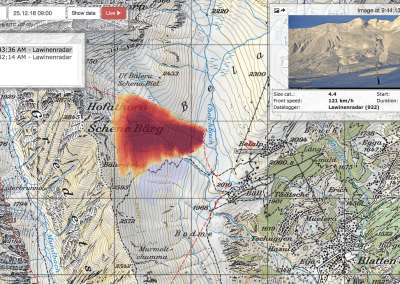 The online data portal displays the avalanche on an area map along with the measured characteristics and a photo series. 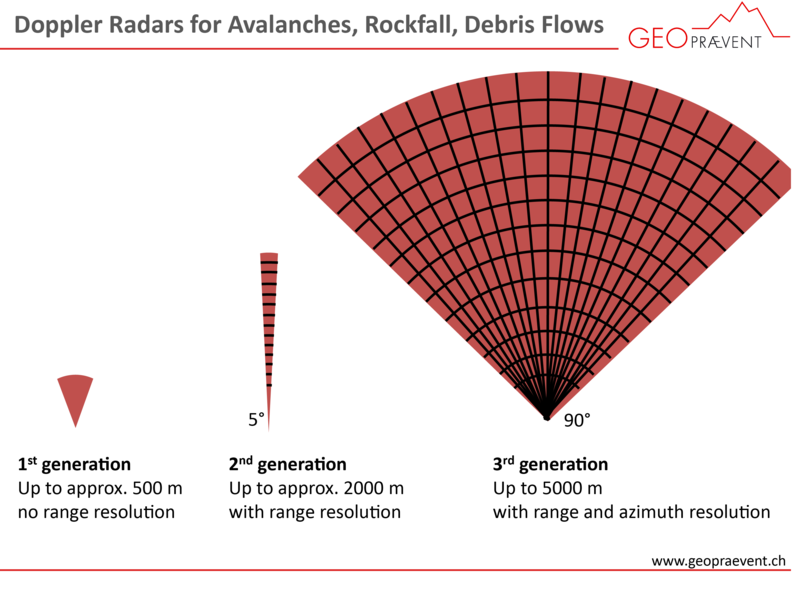 Our 3rd generation avalanche radar covers an area of up to 10 km2. 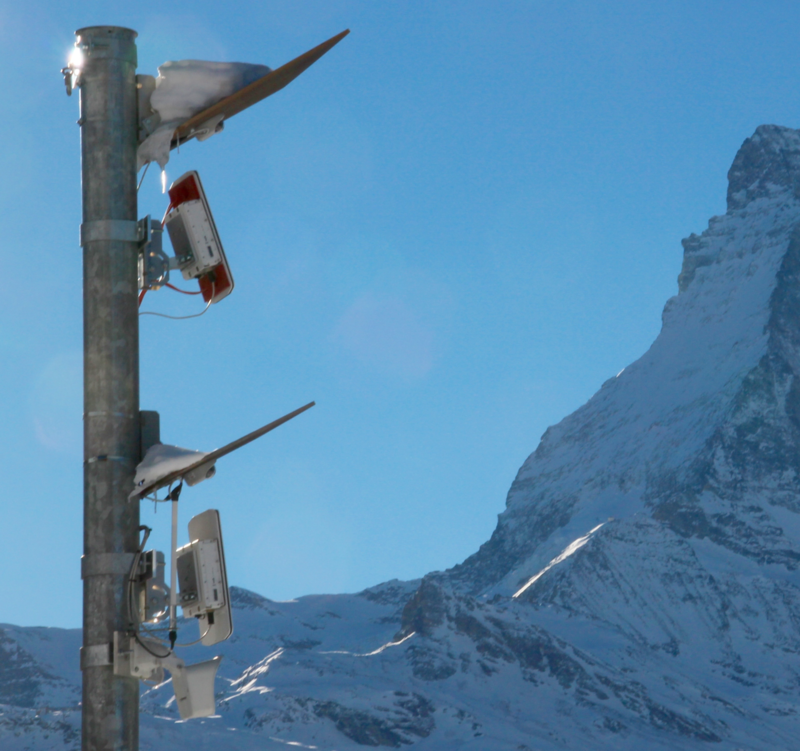 The avalanche radar system in Zermatt monitors two avalanche paths and automatically closes the access road. To date, we have implemented more than 40 avalanche radar projects on three continents. We currently operate over 20 avalanche radar systems in Switzerland, Norway, Chile and Canada. A radar module with smaller range and monitoring area is also available. Detection of an ice avalanche: An estimated volume of 3,500m³ of ice detached from a hanging glacier at Weissmies, Saas Valley, southern Switzerland. The left video shows photos captured once a second during the event. On the right, the radar measurements are projected onto the digital elevation model. The blue area delimits the radar field of view, while the white box indicates the camera view.